Dr. M.T. "Mike" Resch a.k.a. "MTR"
LinkedIn: Article by MTR on the Timeline (5/26/18) New on Resch.com: "I AM"
LinkedIn: Article by MTR on the Timeline (8/19/18) "FREE by MTR"
LinkedIn: Article by MTR on the Pulse (4/12/19) New 8 Channel (7.1) Albums from Resch.com! My Status in "The Windows Insider Program"
At Home by the Fireplace! The great thing about 24 bit Digital Audio is that it enables the ordinary person with a PC to achieve "Studio Quality" Sound for a relatively Modest investment of from $78 to $145 for a 24 bit Sound Card which comes in three basic formats: PCI Internal, PCI Express Internal, or USB External. Put quite simply, a Bit Rate of 4608 kbps is around three times the Bit Rate of Commercial CDs which is 1411 kbps, which is a lot more information being transmitted to your ears, and a Sample Size of 24 bit allows a Frequency Response of from 0 Hz to 48 kHz, greatly exceeding the Frequency Response of from 0 Hz to 24 kHz inherent in 16 bit Sound. This allows the delivery of Stunning Highs in the Treble Range and Amazing Lows in the Bass Range that a person can "feel", even when listening on a good set of Headphones. There is a feeling of a real "Presence" in the Music that makes it sound like the Artists are playing and singing right in front of you, that CD quality Music lacks. Part of my Music Ministry is to help an ordinary person to experience the Excitement and Inspiration of Christian Contemporary Music available from 24 bit Music for Free. Below this Text are Links to Download my Albums in three different Formats: AIFF 24 bit 96 kHz 4608 kbps, AIFF 16 bit 48 kHz 1536 kbps, and MP3 48 kHz 320 kbps. The second and third Formats mentioned can be played on any PC that is able to play Commercial CDs without any additional equipment. Only the first Format requires a 24 bit Sound SubSystem on your PC, resulting in an impressive gain in sound quality. I will now give you some Links to typical 24 bit cards in each of the three categories available. Remember, they're just Examples of 24 bit cards and where to obtain them. I encourage you to search on the Web for other cards that might be more to your liking. My first Example, a 24 bit PCI Internal card is a 24 bit Creative SB X-Fi PCI Elite Pro Sound Card available at NewEgg for around $145 plus Shipping and any Sales Tax due. One thing to Note about this Card: it works fine in Windows 7 & 8 (32 & 64 bit) but doesn't work in Version 1903 of Windows 10 Pro (64 bit) because it does not Support "Core Virtualization" which is a New Feature Microsoft has introduced into their OS for Enhanced Security. The Second Option, a 24 bit PCI Express Internal Card is a Creative Labs Sound Blaster ZxR 24 bit 96 kHz Audiophile PCIe Card, available at Amazon for around $200 plus Shipping and any Sales Tax due. This is the Card I have installed in my PC named "Blackbird". I have nothing but praise for this Device, as it's Drivers written in 2017 for Windows 10 work in my PC running a Pre_Release Operating System of Windows 10 Pro (64 bit) Version 1903, OS Build 18362.53. (the Advanced 2019 version utilizing "Core Virtualization"). I use that Card to Digitally Record Christian Contemporary Radio right off the Web. The third Example, a 24 bit USB External Sound Card is popular for MAC owners, because their Motherboards are not equipped with extra slots, so they must be content using a USB 2.0 Port to accomplish the Task. The best example I found on the Web is a Creative Labs Sound Blaster Omni Surround 5.1 External Card available on Amazon for around $79 plus Shipping and any Sales Tax due. this Box is powered by the USB 2.0 Port it plugs into, generally good reviews on the Amazon Website and works on a PC running Windows 10 Pro (64 bit) Version 1809 (the most recent Update, according to Creative Labs Technical Support). It has Drivers available for different "Flavors" of Windows as well as OSX. I don't "drive" a MAC so I don't have any Personal knowledge of how acceptable this Card is on a PC running OSX. Many people reported it was very good as a Plug & Play device on PCs running Windows. Well, that's about all I have to say on this subject, except that all three Formats of the Audio Files for the Album are designed to be able to be successfully imported into "iTunes" as a Free Player, and they all sound pretty good on "iTunes" as opposed to the Player I use called "GoldWave v. 6.35", which is a 64 bit app designed to run on Windows 7 (64 bit) or higher, and which is designed to accomodate the newest Version of Windows 10 Pro (64 bit) Version 1809, OS Build: 18282.1000. It is a Digital Audio Player & Editor with a many capabilities which far exceed "iTune's" capabilities, except that it costs $15 per year to Lease it or $45 to Purchase a Lifetime License & Free Upgrades. It performs better than "iTunes" on playing all sorts of Digital Audio Files. There are Links elsewhere on this Website, Resch.com where you can Download a fully functiong copy that works for a certain number of operations, then asks whether you want to Lease it or Purchase it. I highly recommend it for Playing 24 bit Digital Audio. Also, instead of a "Visualizer" like "iTunes" has it has Many Real-Time Spectrum Analysis Graphs in Color which show the Frequency vs. Amplitude of each Channel while you are Listening to the Music which I find to be very Entertaining to watch and also very Informative about the "Nature" of the Music. So below this Text you will find Links to Files stored on one of my Google Drives that give you access to the Audio Files, the Album Art for use in "itunes" (3000x3000p 300 dpi .jpg Format) and Song Lists (in 2530x3300p 300 dpi .jpg Format) that give you a reference to which Track is playing by virtue of the Total Playing Time in Dark Blue Color of when each Track starts Playing. One other note: For the MP3 Files, if you Rt+Clk the Link and Open in a New Tab, it takes you to a Download Page that has an MP3 Player Built-in, so that you can Listen to what the Album sounds like before Downloading anything. I have many other Albums like this in varying states of completion, so if you like this Music be sure to Let Me Know using the "Contact MTR" Link in "Contact Information". In order to listen to these Multi-channel sound files you will need two basic components: 1) Audio Software that is compatible with Multi-channel Audio, and 2) a Headset that can discretely serve up the Multi-channel Audio or Speakers. The Best Choice I have found for the Audio Software that runs on Windows 7 (64 bit) and higher OS is called: "GoldWave v. 6.36". 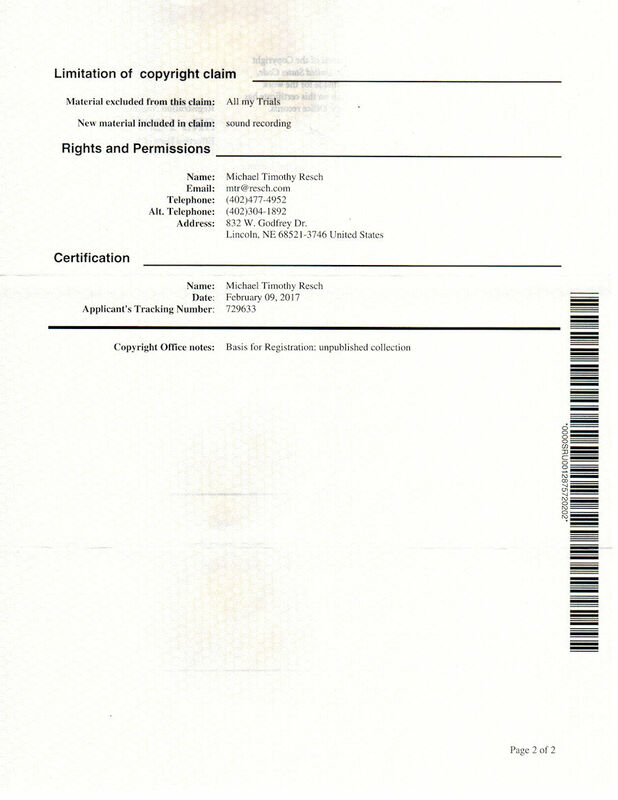 It is available to Lease or Purchase a License to utilize it. GoldWave: v. 6.36 Download GoldWave v. 6.36 to try for Free For Windows 7 (64 bit) or Higher. Designed especially for Windows 10 (64 bit) v. 1903. For Listening to 8 channel (7.1 format) or 6 channel (5.1 format) the simplest solution is to obtain a Multi-channel Audiophile-grade Gaming Headset which usually comes with its own USB based Sound Card for Customization. Here are some suggestions for High Quality Multi-channel Headsets that also come with included Boom Microphones. First there is an Excellent Review of Gaming Headsets: Review of Eight 5.1 and 7.1 Gaming Headsets. I Personally use the ASUS Strix 7.1 Audiophile Grade Gaming Headset which requires two open USB 2.0 Ports. ASUS Strix 7.1 Gaming Headset. This Headset is Available on Amazon.com for Approximately $200. ASUS Strix 7.1 Gaming Headset on Amazon.com. Another High Quality 7.1 Format Gaming Headset is the Razer Tiamat 7.1 V2. Razer Tiamat 7.1 V2 Available from Razer for Approximately $200. Both of these Headphones offer a lot of Customizable features which make Multi-channel Listening Enjoyable. Of course there is also the choice of Speaker-Based Surround Sound Listening. But that requires a lot more space and a Suitable group of Housemates willing to listen to it. Note: Links to Song Lists and Album Art for some of these albums are available further down this Website. "The Best of Steven Curtis Chapman"
Frequency Spectrum at a moment in "Broken Things" from Pandora One 10-16-17 (24 bit 96 kHz) using GoldWave Version 6.31 (64 bit) for Windows (64 bit) running on Windows 10 Pro (64 bit) Version 1803 Build 17025.100 . Below this Text are Links to Download this Album in three different Formats: AIFF 24 bit 96 kHz 4608 kbps, AIFF 16 bit 48 kHz 1536 kbps, and MP3 48 kHz 320 kbps. The second and third Formats mentioned can be played on "iTunes" on any PC that is able to play Commercial CDs without any additional equipment. Only the first Format requires a 24 bit Sound Subsystem on your PC. So below this Text you will find Links to Files stored on one of my Google Drives that give you access to the Audio Files, the Album Art for use in "iTunes" and Song Lists in .jpg and .pdf Format that give you a reference to which Track is playing by virtue of the Total Playing Time in Dark Blue Color of when each Track starts Playing that you can View on the "iTunes" App. One other note: For the MP3 File if you Rt+Clk the Link and Open in a New Tab, it takes you to a Download Page that has an MP3 Player Built in, so that you can Listen to what the Album sounds like before Downloading anything. It's a Neat little "Extra" I Discovered while checking to see if all of the Links worked like I Programmed the HTML Code to do. I have many other Albums like this in varying states of completion, so if you like this Music be sure to Tell me using the "Contact MTR" Mailto: feature Located in "Contact Information". If you enjoy Songs sung by Amazing Artists with Outstanding Voices and a Sweeping Message, make sure to Preview Track 11 with Kari Jobe singing "I Am Not Alone (Live)" and Track 12 Mercyme singing "I Can Only Imagine" on the Embedded Album below this text. Right-Clicking on the Album Title in Red below the Album Art takes you to my Bandcamp site where this Album resides. You may also Download the Album for Free by Right-Clicking on the word Download in Red to the right of the Album Title. If you enjoy Songs sung by Amazing Artists with Outstanding Voices and a Sweeping Message, make sure to Preview Track 4 with Danny Gokey singing "Tell Your Heart To Beat Again" and Track 8 with Natalie Grant singing "Clean" on the Embedded Album below this text. Right-Clicking on the Album Title in Purple below the Album Art takes you to my Bandcamp site where this Album resides. You may also Download the Album for Free by Right-Clicking on the word Download in Purple to the right of the Album Title. Do you have the iTunes App? If you do, then Open it, and Click one of the next two Bitlinks to Listen To or Procure my new Album: "A Cup of Cold Water" (with B&W Cover Art). Don't have iTunes? Google it and Download it for your OS for Free. bit.ly/MTRinAppleMusic If you have a Subscription to Apple Music you can Preview or Add my new Album to your Library for Free in iTunes' Browse. Genres: Catholic, Folk, SingerSongwriter, Christian, Gospel, Electronic. Moods: Spiritual, Charismatic, Devotional, Meditational, Ambient. God's Gift to me My Gift to you For FREE! Do you have a YouTube Account? If the Answer is Yes: Log in to your YouTube Account, Then Return to MTR's Place and Select one of the Two following Hyperlinks. Please Subscribe to my Channel. If you don't have a YouTube Account, you can Visit my Channel or Watch & Listen to my Video Playlist for Free. Shown Below are Hyperlinks to the Frequency Spectrum Analysis of the Individual Tracks from A Cup of Cold Water. If you don't have time to Watch & Listen To the Entire Playlist, you can Click the Hyperlink to one of your Favorite Tracks. If you're Logged In to YouTube, Please Subscribe to my Channel. As an "Audiophile" of sorts I strongly recommend Downloading this Album in AIFF format. Five levels of Processing were used to produce it; three in Hardware using Digital Signal Processing Technology in real time, and two in Software using FFT Technology. The result of this processing is subtle, and is lost in lossy compression algorithm formats like MP3. Enjoy! MTR (Note: If you Download in AIFF, you will be getting the 24 bit, 96 kHz version of this Album, which requires a 24 bit 96 kHz Sound System on your PC. If you only have a 16 bit PC I suggest you Download in MP3 320. This is a very special Edition of the Copyrighted Tracks in "A Cup of Cold Water - Catholic". What is different about them is that the wave-forms that make up the 10 Tracks of the Album have been specially Digitally Modified to achieve what is commonly known as "Studio Quality". In order to achieve this Format, the Original wave-forms were converted from 24 bit, 48 kHz to 16 bit 96 kHz in Software, pre-processed in Hardware using a "Creative SB X-Fi" PCI sound card containing a Hardware Digital Signal Processor (DSP) called a "Crystallizer", and also pre-processed in Hardware via DSP to "re-equalize" the Bass & Treble tones and add the Room Acoustics of a moderately lively Recital Hall. Then this modified Bit Stream was processed again via stereo Digital to Analog Converters (D/A) to an Analog stereo signal. This Signal was then fed into Stereo Analog to Digital (A/D) Converters for Digitizing the modified signal at 16 bit, 96 kHz. Then the Format was converted again to a higher resolution 24 bit Sample Size in Software at, 96 kHz Sample Rate, 4608 kbps Bit Rate, stereo Format. At this new Resolution the Frequency Spectrum was "re-equalized" in Software in order to Optimize the Sound Quality, and the Maximum Amplitude of each wave-form was adjusted to -0.5 dB in Software in a process known as "Maximum Amplitude Normalization". This process taken as a whole is known as "Sound Engineering", and is the way that the Sound of the Album was adjusted to become "Studio Quality". bit.ly/MTRonBandcamp Info, Lyrics, Free Downloads for: A Cup of Cold Water - Catholic and Contemporary Christian II. Downloads of A Cup of Cold Water - Original are $13.00 or more, & Downloads of Ambient Seashore are $8.00 or more. Check out the New Merchandise including Unisex Hoodies, Men's Tee Shirts and Women's Tee Shirts with New, Original Artwork by MTR. bit.ly/MTRsNewHoodies "New A Cup of Cold Water Design" Hoodies to Help Support MTR, Inc. on MichaelResch.Bandcamp.com. Hoodies come with a Free Download of my Digital Album with 13 Tracks, A Cup of Cold Water - Original, a $13.00 dollar Value included with Bonus Items all for Free. Rt+Clk on the Bitlink to see the Details of Price, Style, Colors, Shipping & Handling and Sales Tax. bit.ly/MTRsMensTees "New MTR Self Portrait Design" Men's Tees to Help Support MTR, Inc. on MichaelResch.Bandcamp.com. Men's Tee Shirts come with a Free Download of my Digital Album with 13 Tracks, A Cup of Cold Water - Original, a $13.00 dollar Value included with Bonus Items all for Free. Rt+Clk on the Bitlink to see the Details of Price, Style, Colors, Shipping & Handling and Sales Tax. bit.ly/MTRsWomensTees "New MTR Self Portrait Design" Women's Tees to Help Support MTR, Inc. on MichaelResch.Bandcamp.com. Women's Tee Shirts come with a Free Download of my Digital Album with 13 Tracks, A Cup of Cold Water - Original, a $13.00 dollar Value included with Bonus Items all for Free. Rt+Clk on the Bitlink to see the Details of Price, Style, Colors, Shipping & Handling and Sales Tax. I am a #Catholic #Folk #SingerSongwriter inspired by the Gospel of Matthew 10:42 to give "a cup of cold water" for free to the least of the brethren for the brethren's sake. My Mission is: First, to use the proceeds from selling Downloads of my Album on iTunes and other Partners to get enough funds to use LegalZoom to create a Nonprofit Entity called MTR, Inc. to support worthy Catholic Causes. 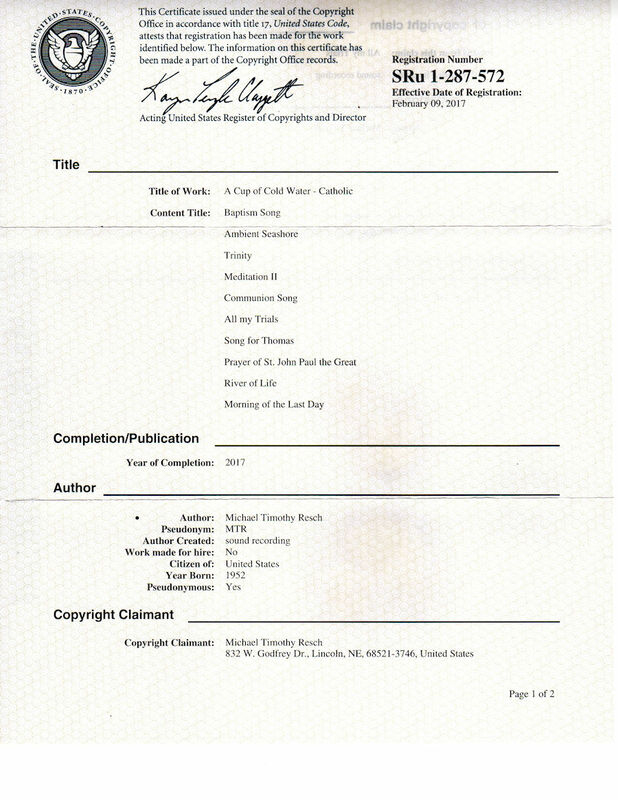 Second, to assign the Copyrights to my Album applied for on 2/9/17 to MTR, Inc. once they are assigned, and to further use MTR, Inc. to Copyright the Melody and Lyrics to the Vocal Tracks on the Album. Third, to continue to use my Twitter Account, MTR (@MikeResch) and my account on Bandcamp to continue to give free Downloads of "A Cup of Cold Water" to the least of the brethren for the brethren's sake. Fourth, to develop a Following on my new Twitter Account, MTR, Inc. (@MTRinc2) to promote my newest Album in order to solicit funding for my new Nonprofit. Old Viking Proverb: "Anything that doesn't Kill you outright Always makes you Stronger"
The best way to use this Section is as a "Listening Experience" for the individual Tracks in either A Cup of Cold Water - Original, Ambient Seashore or A Cup of Cold Water - Catholic. The Embedded Albums for all three Albums are connected to my Site on MichaelResch.Bandcamp.com. You can Listen to Individual Tracks to get a "Feel" for the Style of Music that each Track has. You can also Read the Info and Lyrics of each Track while they are Playing by Scrolling to the Bottom of this Site and Scrolling down through the PDF of the Info and Lyrics to the Track you are listening to. If you use Firefox as your Browser You can also Download this PDF on your Browser or Print it out on your Default Printer. You can Rt+Clk the colored Hyperlink bearing the Title of each Embedded Album and Open in a New Tab to explore the "info" and "lyrics" of each Track on the Album. If you're sure you want to import an Album into iTunes make sure to choose the File Format "AIFF" or "MP3" for your Download, as "AIFF" has a Sample Size of 24 bits and a Higher Bit Rate which Exceeds the Acoustic Resolution and Bit Rate used in Commercial CDs giving you the best possible Listening Experience. "MP3" is a better choice for Portable Players like Smartphones because the File size is around 1/7 the size of "AIFF" Albums. As a Plus, you have all three Albums in one place to choose from. The Sound Files you Listen to on the Embedded Albums are MP3, 44.1 kHz, 128 kbits/sec Bit Rate Format which are considered "Low Fidelity" because what you are hearing is being decoded at 128 kbits/sec, plus, MP3s are by nature Lossy in the highest and lowest Octaves of sound by virtue of the Algorithm used to convert the format from AIFF to MP3 which makes them sound "thin". So you shouldn't judge the recording quality of an Album from only listening to the Sound Quality of the Embedded Albums. The Sound Files I Upload for the Albums on my Bandcamp site, are Apple AIFF PCM signed 16 bit, 48 kHz Sample Rate, 1536 kbits/sec Bit Rate Stereo Format which are considered "High Fidelity" and are in fact Superior to the Quality of the Red Book Audio PCM signed 16 bit, 44.1 kHz Sample Rate, 1411 kbits/sec Bit Rate, Stereo Audio Files used in Commercial CDs because the sound you are listening to is being decoded at 1536 kbits/sec.